There is a vast gulf between humans and the great apes. While we share some superficial similarities with them, they are dwarfed by significant differences. For example, most (but not all1) evolutionists think that our closest living relative is the chimpanzee, because our genomes are the most similar (72%-95% similar, depending on how you make the comparison). Nevertheless, there are distinct anatomical and behavioral differences between humans and chimpanzees. Indeed, nearly every bone in the chimpanzee body is individually recognizable as chimpanzee and not human simply by its shape and size. Humans and chimpanzees also have different postures, different means of moving around, and different methods of obtaining food. Of course, the biggest difference between chimpanzees and humans is that of intelligence. People have a level of intelligence not seen anywhere else in creation, and it is apparent through our ability to create amazing technologies, produce breathtaking works of art, develop philosophies, and communicate across the generations. So what is it that produces the remarkable difference between apes and humans when it comes to communication? Evolutionists thought they might have at least a partial answer to this question. If you look in detail at human genes and chimpanzee genes, you see some remarkable differences among those genes that deal with hearing. As a result, it has been widely suggested that the human lineage experienced “accelerated” evolution in its hearing genes, which in turn produced our ability to utilize language, which in turn produced our ability to communicate in a sophisticated way. Not surprisingly, additional data have falsified this evolution-inspired notion. 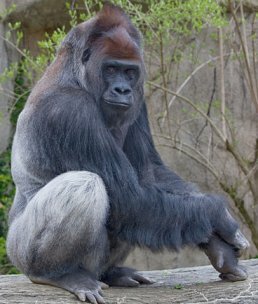 We found that gorillas share many parallel genetic changes with humans including the evolution of our hearing. Scientists had suggested that the rapid evolution of human hearing genes was linked to the evolution of language. Our results cast doubt on this, as hearing genes have evolved in gorillas at a similar rate to those in humans. Scally [the lead author of the study] adds that it could well be that there has been a parallel acceleration in these genes for two entirely different reasons – that human hearing has developed because of speech and gorilla hearing has developed to serve an entirely different, but as-yet-unknown, purpose. As I have mentioned previously (here, here, here, and here), the constant need for the concept of convergent evolution is a serious problem for the hypothesis of evolution. After all, when two structures (or genes) are similar in different species, how can you tell whether it is the result of common ancestry or convergent evolution? First, you check the hypothesis. If evolution can accommodate the common ancestry explanation, then the similar structures (or genes) are the result of common ancestry. If not, they are the result of convergent evolution. This practice definitely preserves the hypothesis, but it does so with absolute disregard for the data themselves. Some might call that “science.” I most certainly do not. 1. John R. Grehan and Jeffrey H. Schwartz, “Evolution of the second orangutan: phylogeny and biogeography of hominid origins,” Journal of Biogeography 36:1823–1844, 2009. 3. Aylwyn Scally, et al., “Insights into hominid evolution from the gorilla genome sequence,” Nature 483:169–175, 2012. I take from this that the Apes learn causes and effect relationships with the symbols that they learn. This way they are able to respond appropriately but have no actual cognitive recognition of what the symbol means. Is this correct, or does the statement mean something else? Good question, D. Perrine. Based on my reading of the experiments, it is more association than cause-and-effect understanding. For example, if you say “treat” to a dog and then give it a treat enough times, it will eventually associate that word with a treat. As a result, when you say “treat,” it will get excited, because it associates the word “treat” with an actual treat. In the same way, apes seemed to associate symbols with concrete things. As a result, they could use those symbols to indicate their desires relative to those concrete things. So I think they do have some recognition of what the symbols mean. However, they have no understanding of the concepts the symbols represent. As a result, they cannot use the symbols in a truly original way. When I learned about the Savage-Rumbaugh study in psychology I got a very different impression from that. The pygmy chimps were not only able to recognize both lexigram symbols and diverse sentences in spoken English, they could also creatively form simple sentences out of those symbols. They could refer to objects that were absent, form sentences directed at others (Give X to Y) instead of (give X to me), and even employ metaphor and figures of speech. Moreover much of their initial learning was by watching their relatives using the machines, and they didn’t need treats to learn new words. I am by no means an expert on this, Josiah, so you might very well be correct. However, as I understand it, at least some have analyzed the Savage-Rumbaugh studies and say that the results are exaggerated. For example, I know that the study in which the person commanded Kazi (the younger bonobo) from behind a one-way mirror, it was concluded that Kanzi understood grammar. However, a review of the tapes showed that often times, Kanzi was given several attempts to get something right, and in addition, an incorrect action was noted as done correctly if it was close enough. As a result, people like Steven Pinker say that the only thing the Savage-Rumbaugh studies demonstrate is that bonobos can develop vocabulary, not language. I agree that treats were not used, and that Kanzi picked up much of his vocabulary by watching his mother’s training, not by being trained himself. I have a question concerning animal language. We all have seen (probably) movies that portray animals talking in their own language but all we hear is ‘quack,’ ‘moo,’ ‘woof,’ etc. To the animal, what do these noises mean? I assume that a duck just does not wander along ‘quacking’ thus giving its position away to a predator but rather it has some purpose. D. Perrine, vocalizations in animals do mean things. They just don’t carry the complex ideas that human language does. I am not sure why a duck quacks, but a dog barks, growls, and whimpers to send specific signals to other dogs, animals, and people. So when a dark barks and growls aggressively, it is telling a person or another animal to stay away. When it barks with short, sharp barks, it is telling the person or other animal that it wants to play. When it barks in a high-pitched way, it is telling its pack (or master) that it is stressed. When it howls, it is either marking territory or looking for others, depending on the species. When it yelps or whimpers, it is in pain. This isn’t the kind of communication that is done with a language. It is an instinct-driven communication that simply sends survival-related signals to others. So dogs do communicate with others using sounds, but they do not have a real language. They just communicate very basic things. This seems to be true of all the animals. I can train my dog to obey commands (Verbal, sound and sign), shake hands, my dogs offspring can learn from my dog by watching and observing, adult sheep dogs “train” juvenile sheep dogs by example and repetition. I’ve had dogs that can point out objects and live animals, show happiness, sadness, etc etc. As far as I am aware, no scientist thinks that we came from dogs because they can communicate in a sense with humans. So the question has to be asked, why on earth would such common features of response to humans found throughout so many animals be evidence of anything other than everything has a common connection of conscience response through intelligence. I think the blatant evolutionism present in ape behavioral studies is a slur on the intelligence of those conducting the studies. Excellent point, Ty. And, of course, it is not even clear that apes are the most “intelligent” animals on the planets. Based on behavioral experiments, crows seem better than any other animal when it comes to using tools and solving problems. Pigeons have been shown to be able to figure out basic probabilities, and there are many animal behaviorists who think dolphins are the smartest animals on the planet. I think the idea that apes are the smartest of the animals is based mostly on evolutionary bias and has little support in the data. Technically, humans make animal-like noises, such as growling and screaming. Of course, you might not growl, but I find it expresses my feelings rather well sometimes. But we also have a higher level of communication, so it would appear that there is a major difference between sounds meant to communicate emotions and intelligent conversation. I didn’t think so highly of the tests done on Kanzi’s vocabulary, but on the anecdotal evidence. Language command may be tested, but the complex communication it conveys can’t really be. Perhaps my favourite example is Kanzi being locked indoors for trying to eat mushrooms in the wild. He went to the lexigram and signed “Kanzi No Eat Mushroom”. Sure enough he was released and didn’t repeat the offence. To me that is much more significant for this situation than picking out the photo of a banana to match the sign for a banana in a double blind trial. Differences in their vocal chords clearly prevent chimps from talking, but they don’t necessarily stop them from conversing. But Josiah, how impressive is that? I punished my kitten when she climbed on the kitchen table. It is the only surface I punished her for getting on, and now, she doesn’t get on the kitchen table, at least not when my wife and I are around. She goes pretty much anywhere else she pleases, but she avoids the kitchen table. Thus, my cat understands the idea that “Curie no get on kitchen table.” She ended up communicating this fact to me by not getting on the table anymore. The only thing Kanzi did differently was convert the terms “eat” “no” and “mushroom” into symbols. Once again, as Pinker says, this just demonstrates a level of vocabulary. It does not indicate any kind of sophisticated communication. No, it indicates an ability to use that vocublary creatively. This wasn’t a phrase that Kanzi had been taught to say. Skinner showed that you can teach a pigeon to push a button with a symbol on when it sees food and to associate the food with that button. In the same way Kanzi was perfectly able to push the mushroom button to say he wanted to go out to where mushrooms grew in the forest. But to attach meaning to the symbol and be able to combine symbols so as to modify the meaning, conveying not a basic desire but as complex a concept as understanding his offence and promising not to commit it again…that to me is a much more impressive feat. It cracks me up that you would name your kitten Curie. Of course, I love literature and I named my fish Peaceable Sherwood, so I suppose it’s kind of the same. Grace, we have a history of naming our cats after famous scientists and mathematicians. We have had an Einstein and a Fermi in the past, and our other cat’s name is Sophie, after Sophie Germain. For whatever it’s worth, I would just like to point out that regarding the data the research has gathered, what it disproves is the hypothesis that hearing-gene development was/is the cause of higher-level communication. To provide a hypothesis of why changes in human and gorilla “hearing-genes” were so similar, let me just suggest that it was merely driven by a need for better hearing. The most direct impact of a change in a “hearing-gene” would be with regards to a physical structure of the ears – And where would the pressure for better hearing come from? I would point out that both humans and gorillas are primarily ground-dwelling creatures – this places them at greater threat to ground based predators as well, which would necessitate better hearing, to increase the survivability of the being by providing better situational awareness. The chimpanzee has far less need of such advanced hearing – its defense is its ability to take refuge in the foliage of the forests chimps are typically found in. My regards to curie, she sounds like a marvelously intelligent cat..! Perhaps you would like to reconsider your example of Curie-and-the-kitchen-table in light of behavioral training ie. negative reinforcement? She doesn’t communicate anything in her subsequent action, but she learns that getting on the table is bad (for her) – so she doesn’t. Even children at a young age understand that doing certain things will incur penalties (often painful ones, like a good spanking), and as a consequence simply refrain from doing such things. This is a simple cause-effect relationship that really shouldn’t be used to indicate “communication” of any kind. God Bless, and good day. Thanks for your comment, Jason. I would agree that the data demonstrate the difference between hearing genes in chimps and humans is probably not the result of language. I doubt that your hypothesis works, however. The means by which you escape has little bearing on how you must be warned to escape in the first place. Since gorillas and chimpanzees are mostly forest-dwellers and humans are not, I would expect gorilla and chimpanzee hearing to be more similar if it were merely an issue of situational awareness. After all, they are in more similar situations. In addition, most evolutionists think that humans evolved better eyesight because they left the forest and eyesight became their most important resource when it comes to situational awareness. As a result, it is not clear why humans and gorillas would evolve similar hearing. In any event, based on what has been discussed in both the study and the commentary on the study, most evolutionists are clinging to to idea that human hearing evolved for language, and they are desperately suggesting convergent evolution to explain the gorilla’s hearing. Please note that I did not raise the Savage-Rumbaugh study. That was raised by a commenter. In the original post, I simply allowed an expert to express his opinion on the ape communication studies in general. I do agree with you that it is pointless to think that apes can communicate in any sophisticated way. As you correctly point out, the mind of humans is simply too different from that of apes, contrary to what one would expect in an evolutionary framework. Thanks for your kind words regarding Curie. She is a wonderful pet, but I would not call her “marvelously intelligent,” even when comparing her to other cats. I would also disagree that she is not communicating by avoiding punishment. Because she is avoiding punishment, I know that I have communicated to her that getting on the kitchen table is bad. The very fact that I know I have successfully communicated something to her indicates that she has communicated with me. I gave her information (“don’t get on the kitchen table”), and she has given me information (“message received”). That’s the essence of communication. Kanzie used words. I have no issue with that as I have had pets that spoke that could not write. As an example: I had a cat that would call me when he came to the door to get in, in english, and by the name i used with him. Animals of all kinds communicate very clearly. I have owned snakes, ferrets, cats ,dogs, cockatiels, lizards, turtles, monkeys, squirrels and more and could go on endlessly telling you of how the communicate their desires, thoughts, regrets, irritations, anger, hurt, affection, and wants as well as needs. Animals are intelligent creatures, all of them. No one is greater than another in it ability to communicate. We do not study dogs or cats when they speak (and they can), or birds who speak because the scientist call it mimicry. Even the trained responses that are random and show the intelligence of the animal behind the use of a verbal communication. Why is that? Because it doesn’t support evolution. The chimps do no more than an over trained animal can. The difference is that they of all animals come closer to the evolution believer’s model. Their faith demands they look only there and not take their eyes off their prize of justifying their religion. If they looked honestly at their own evidence (and many have which is why we have disbelievers now) they would realize how much they have missed in their “scientific” quest. So yes, Kanzie could communicate and understand correction. I have yet to meet an animal that couldn’t. Even up to using the human language in verbal or written form. Dschastain, did your cat really vocalize a name in English, or am I misreading the example in your comment? My cats vocalize certain things to me (“thrown this toy I just dropped on the floor,” “sit on the couch and let me jump in your lap,” “protect me from the thunder,” etc.). However, I have never experienced a cat actually vocalizing a word. I strongly agree that animals of all kinds communicate. That’s very clear. As you say, I don’t see anything extraordinary about how apes communicate when compared to how other animals communicate. A sort of tangent idea to that is- it must be so incredibly depressing to believe in evolution and to think that it all is chance. The bleakness of going through life thinking that there is no God is incomprehensibly awful to me. Vivielle, I have no problem with scientists coming up with explanations as to why this set of data or that set of data don’t agree with their hypothesis. A certain amount of such explanation is, in my opinion, unavoidable. However, at some point, scientists have to recognize that when they need to do this for the majority of the most important data, there is something wrong with the hypothesis. Some scientists have finally recognized this when it comes to evolution. Others have not. I expect that as more and more data continue to go against the hypothesis, more and more scientists will start recognizing the problem. Much like beauty, depression is sometimes in the eye of the beholder. I have listened to some scientists talk quite eloquently about the “wonder” they see in evolution. It doesn’t seem to depress them. Guess I should have been a little clearer. I have no problem either with coming up with a reason that the data doesn’t fit the hypothesis, but agree with you that if you have to do it all the time there might be something wrong. That’s what happens when you write comments when very tired! Well, it really doesn’t matter tremendously whether or not a worldview is depressing. After all, that doesn’t affect its veracity. “Depressing” is quite relative, considering the miserable view of life in general taken by many Christians, i.e. gnosticism. This comment really belongs on the post “I No Longer Work for Apologia Educational Ministries” from August 14, 2010, but it’s far too late to post there! I just discovered your blog and it’s neat to see your voice on the internet again. I was a homeschooled highschool graduate in 2008 and had worked through nearly all your books by then. I’m graduating from college in the spring and will be pursuing a PhD in physics in the fall. Back when Apologia Educational Ministries was yours, I frequented the site often. The “Lounge” forum was such a good hangout. Thanks for offering a way for homeschooling science geeks from around the world to connect. 🙂 I was very sad when the forum went away, but still remember the usernames and stories of many of the regulars there. I don’t know if there’s any such forum for highschool homeschooled “geeks” in existence today (there’s not one at apologia.com), but there definitely should be. Thanks so much for your comment, Emilie! I am thrilled that my courses were a small part of your education, and congratulations on being accepted into a physics PhD program. God Bless you in your endeavors! I agree that there should be such a forum available. However, I don’t know of one. La Presidenta and Other News from Costa Rica Interaction Interruption?